Successfully Added Windows Mini PC Onda M2 - Windows 10 OS, 4GB RAM, Quad-Core CPU, Intel HD Graphic, 120GB SSD Storage, 500GB External Memory to your Shopping Cart. 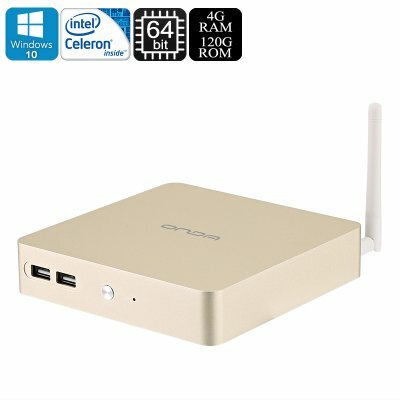 With the Onda M2 Mini PC, You’ll be able to turn every large screen TV and PC monitor into your own personal computer. Thanks to its lightweight and compact design, this Windows mini PC can be carried around effortlessly anywhere you go – allowing you to take along all your personal files, games, and entertainment at all time. Supporting ultra-fast WiFi connectivity, it even allows you to browse the web via your television, turning it into one of those high-end Windows SmartTVs that brings along hours’ worth of fun and entertainment for you and your entire family. Featuring 120GB SSD memory and an external memory support up to 500GB, the Onda M2 Mini computer is guaranteed to support all the space needed to store your media and work or study related files. Thanks to its Windows 10 OS, this mini PC lets you enjoy all the latest Office programs. Due to this, this mini Windows computer is perfect not only for browsing the web, watching movies, and playing games, but will also meet all your business-related demands. Within its compact body, this Windows 10 mini PC packs the powerful Intel Celeron J1900 processor. This Quad-Core CPU has been built to deliver a fast and powerful performance at the cost of minimal electricity – thus bringing along an energy efficient user experience. The mini PC furthermore packs 4GB of DDR3 RAM that lets you engage in excessive multitasking sessions as well as demanding games without dropping a frame. Whether you use it for business, school, or entertainment – the Onda M2 Mini PC is guaranteed to meet all your demands. Simply connect it to any large screen or display and you’ll be able to enjoy all its latest Windows features and your personal files. Great for people who travel a lot and like to bring along their personal data – this Windows 10 mini computer offers ultimate efficiency.